Editors: Gipp, Gerald E., Warner, Linda Sue and Pease, Janine et al. 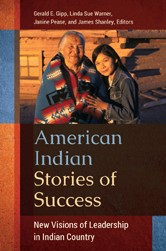 This book is written primarily for those young leaders who are beginning careers where they work with Indian tribes and organizations. Each of the stories found in the book represent significant challenges and barriers, along with the reflections of having lived these experiences to become a stronger leader. This book can help younger leaders avoid the mistakes of the past and will help them develop the skills that will sustain them. One Visions of Educational Revolution - Dave Archambault Sr.